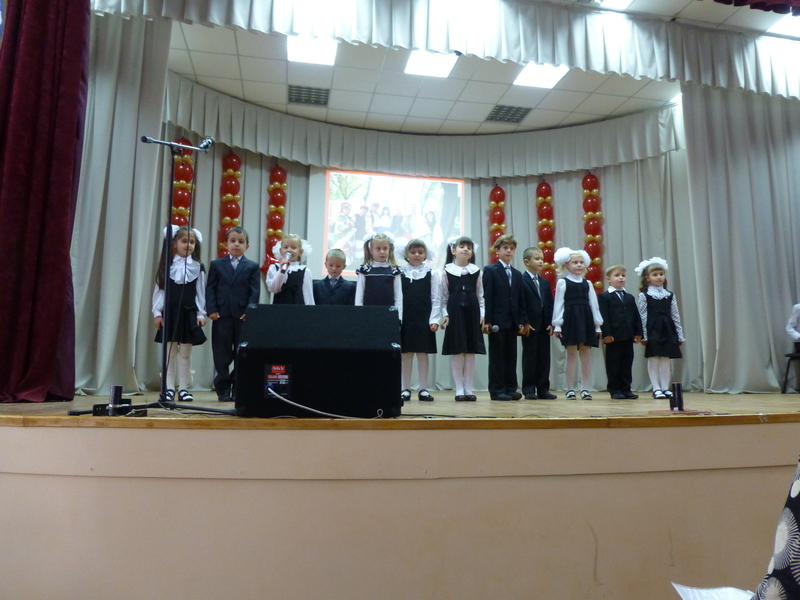 October 2nd marked my third time celebrating teacher’s day in Ukraine. What an awesome holiday. It is a shame that it isn’t celebrated in the USA although it is technically scheduled for the first week of May. First, the older grades teach the younger students in the classrooms. This gives the students and excellent opportunity to understand the difficulties of being a teacher (planning the lesson, classroom discipline, frequent frustration) as well as feel the joy of successfully teaching a topic. Second, the students run around the school between lessons presenting their favorite teachers (or ones with which they need to up their grades) boxes of chocolates, flowers and other small presents. It is so much fun to see their huge smiles and nervous giggles as they approach each teacher. 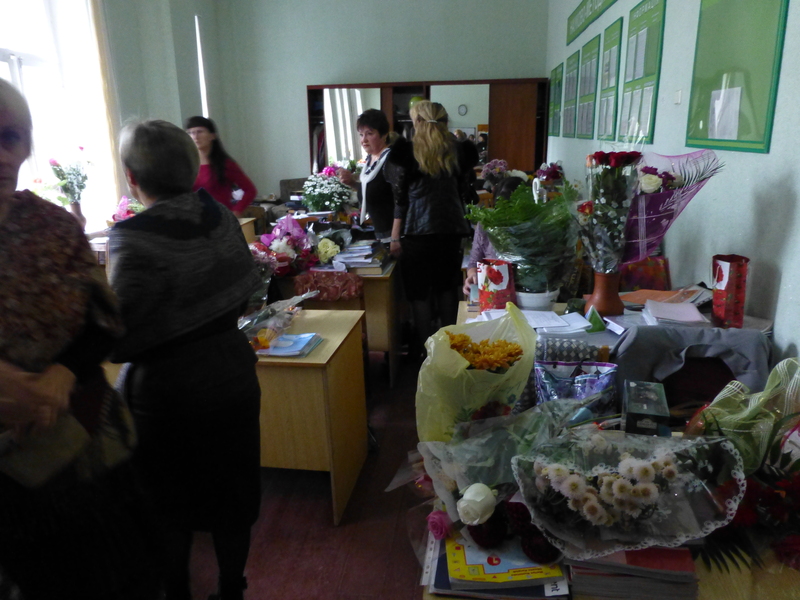 Meanwhile, the teacher’s room is piled high with colorful boxes and bouquets after just the first lesson. I received a bunch of flowers and chocolates but it was nothing compared to some of the more senior and strict teachers who receive so many that they need to take a taxi home! Third, at my school this year they Student Government prepared something special for the teacher’s relaxation. In the Home-Education room, they prepared tables like a little cafe complete with cookies, tea and coffee that we could visit between lesson or in our free time. In addition, the students monitoring and cleaning the cafe talked with the teachers about their personal reflections on being a teacher. Fourth, as usual, everything is celebrated with a concert. Our school is known for our epic presentations, beautiful stage (less than 2 years old with space for 200 people in the audience), dance groups and amazing singers. They didn’t disappoint for us teachers. Our day was cut short (only 4 lessons) and we had a private showing of the concert at 11am. The students performed it later in the day for their families and students from other schools were invited to perform. The 1st Grade wishing us happiness, love and health! Fifth, we rented out the biggest and best restaurant in town and about 50 of the 70 teachers got together for a feast at 5pm. There was great food, lots of drinks, frequent toasts (of which I made 2…in Russian) and of course dancing! It was a great time but I also got very emotional when the Director was giving her toast. I realized how much I will miss these people when I leave in 2 months and after all the ups and downs we’ve been through, how much I feel at home with them and accepted in their lives. At the end of the night…dancing break from eating.